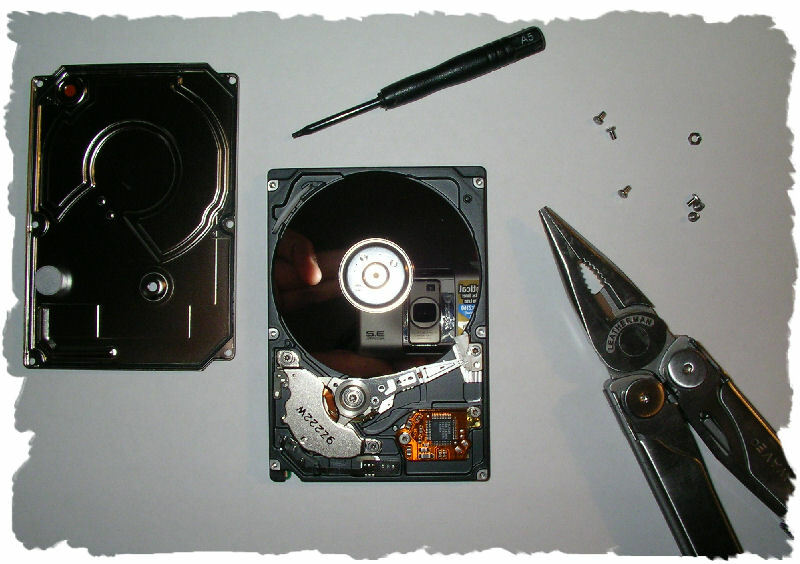 I have this broken 6GB 2,5″ hard disk drive (HDD) I recently removed from an old notebook. The notebook is fine, but this HDD just refused to work. It requires some a) sweet talking, b)prayers or c) external pressure to get this thing going again. After all, all I want is to retrieve the data from this HDD. Having said that, options a) and b) didn’t bring the required change, so I had to apply option c): external pressure. Now, what’s pressure? Think of powaaafullll women awaiting the press their husbands with a rolling pin or even a frying pan and you get the picture. 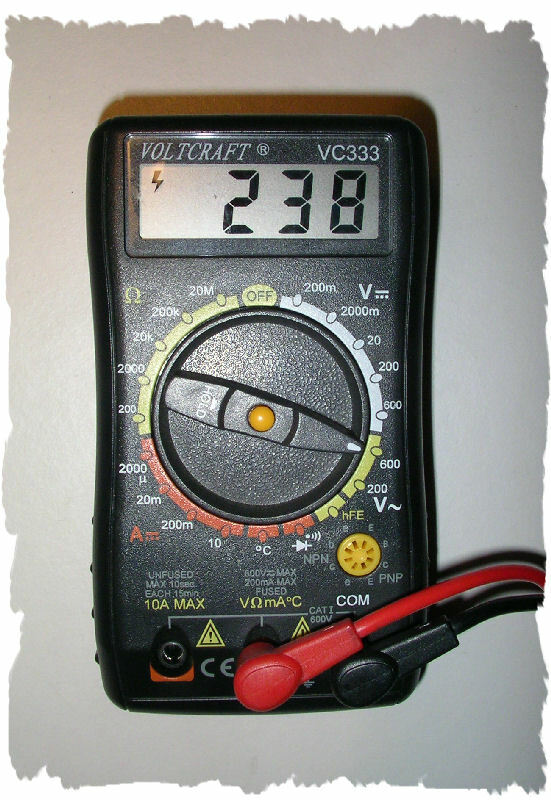 In terms of electrical devices, this pressure relates to a an extra ordinary high voltage. 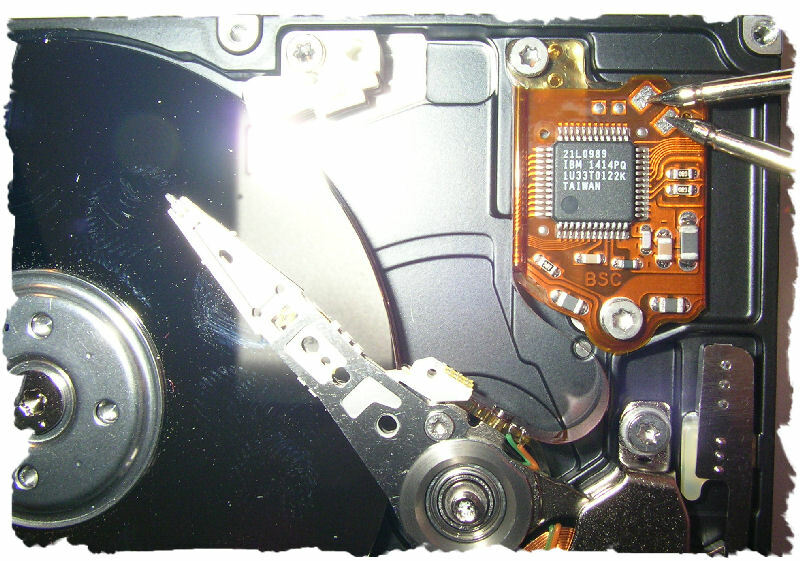 Whereas this small 2,5″ HDD normally requires a low voltage of only 5 Volts (n.b. : USB port provides this voltage @ 500mA), I took the convenience of using the ~220 Voltage provided directly from the socket (as you can see from the picture, that voltage is even higher). 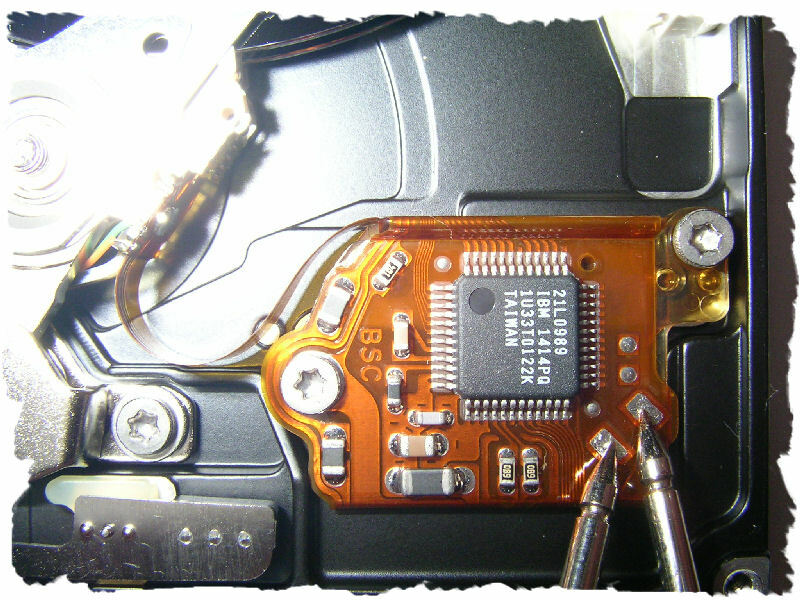 This is an IBM Travelstar DBCA-401060 HDD and it was quite easy to identify the necessary solder points on the printed circuit board (PCB) where I just needed to attach this high voltage. The IBM 1414PQ IC chip they’re using to control the stepping of the read head inside is said to be of low quality since it was made in Taiwan & China. That is, analog to any tumescent political differences between Taiwan and mainland China, the chip is said to be a direct result of having been designed in Taiwan and produced in China. Well, I don’t know if that’s the real explanation for the chip’s frequent failures (I read this on the internet, so it’s gotta be true in one way or another…you know, rumours and other viral marketing..), but the bottom-line is that the chip is used to high pressure and thus shouldn’t have any problems handling a slightly higher voltage of 220 V.
Mind you, a voltage of 220V is dangerous, so please only do this if you know what you’re doing! AOB: ? Maxïmo Park “apply some pressure” ? aiii! You nearly made me crack open my Nokia 6230 and now I’m looking at my old HDD with evil eyes! Brilliant! Hehe :-) Mental, what’s wrong with your Nokia? Bad reception/antenna? Nothing wrong with! But when I saw you open yours I was tempted to crack my open as well! hehe. Btw, talking of Nokia mobiles – did you know you can get a free firmware upgrade within the first year of purchase? The current firmware on mine is 5.24 but I read it somewhere that there’s an upgrade available. Had bought it (6230) with version 4.40 and went for the upgrade last year.